Disasters like floods, hurricanes, chemical or nuclear accidents may cause the necessity to evacuate the affected area. The evacuation of the urban area needs to be planned carefully. One issue is the reorganization of the traffic routing. Congested urban areas have usually complex street networks that are composed of many intersections with streets connecting them. The population density of a congested urban area is usually high and the street network is already used to capacity during rush hour traffic. The considered problem of this work is the reorganization of the traffic routing of an urban area for the case of an emergency mass evacuation. Especially aspects of the evacuation like safety, avoidance of delays and the total system travel time are taken into account. Combinatorial and graph theoretical aspects are adapted for the evacuation problem and highlight issues concerning especially conflicts within intersections. This work gives an extensive summary of literature of evacuation of urban areas. 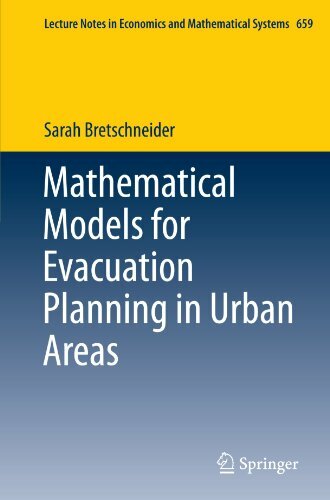 Mixed-integer linear programming models are developed for evacuation problems and heuristic algorithms are provided and tested.? View More In Operations Research.